Design Tool Inc. offers Automatic Presenter Systems for screws, bolts, nuts, and pins. These systems are typically used for fasteners that cannot be blown to automatic screwfeeding equipment due to the fastener design, or for locations that do not have room for automatic feed screwdrivers. These systems present an isolated fastener at a fixed pickup point so that the driving or pick and place system can access the individual fastener. Productivity increases significantly by operators not fumbling with fasteners and reduces worker’s injuries or claims. These systems promote fast and easy assembly with a more ergonomical range of motion. The fastener pickup can be accomplished using magnetic bits or sockets, vacuum systems, or gripper systems in pick and place applications. These systems can accommodate both pneumatic and DC electric screwdrivers, and vacuum pickup drivers for stainless steel fasteners. These presenters work with manually operated or robotically mounted drivers, as well as robotic pick and place systems. We can design the pickup point to accommodate almost any pickup device. The Automatic Presenter System employ rugged vibratory bowl feeders with custom designed heat treated steel escapements and pickup points to meet our customer’s high volume production. The systems are typically designed with fiber optic switches to control the bowl feeder system for ease of operation and simplicity. 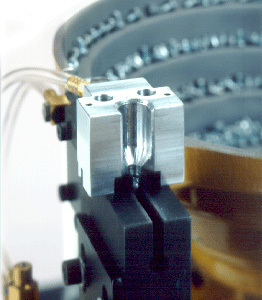 When a fastener is picked up, the fiber optic switch turns the bowl feeder system on to advance the next fastener. The bowl run time is controlled by a timer on the fiber optic controller, minimizing wear on the bowl and reducing back pressure on the fasteners. Design Tool has answered the demand for assembly manufacturers that wanted superior quality presenters for high volume throughput. Our machines outlast most of the competitor’s cheaper systems four to one in durability, reliability, and repeatability extending longer lifecycles. Please contact us for more information and pricing.